Since 2007, Montana Post Driver has been revolutionizing the fencing industry. As fence builders ourselves, we believed there had to be something better in post drivers. We invented the hydraulic hammer post driver. Since then, we have refined and improved our post drivers. Today, farmers pound their posts, and fencers grow their businesses with Montana Post Driver. Through our hydraulic concrete breaker-based design, posts are driven by jackhammering them into the ground. You maintain full control of the post while driving at a rate of 800 blows per minute. The domed cup design enables you to push and pull the post straight, and the attached chain serves as a plumb bob and depth gauge. Because all moving parts remain above the post, our design also allows the user to reach over an existing fence to drive posts on the other side. 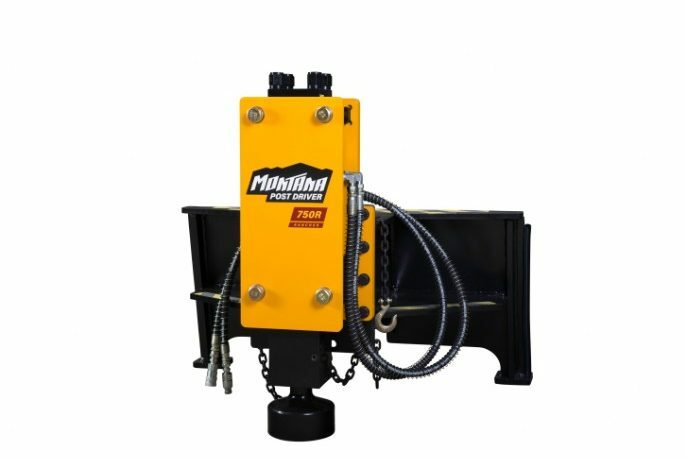 A single operator is able to drive straight and true fence posts without the assistance of a spotter, increasing job safety by keeping your operator in the seat of the loader and eliminating the need for someone to stand by the post. Our design is not top-heavy like conventional products on the market. Low center of gravity reduces the chances of tip-over and allows for easy storage when detached. 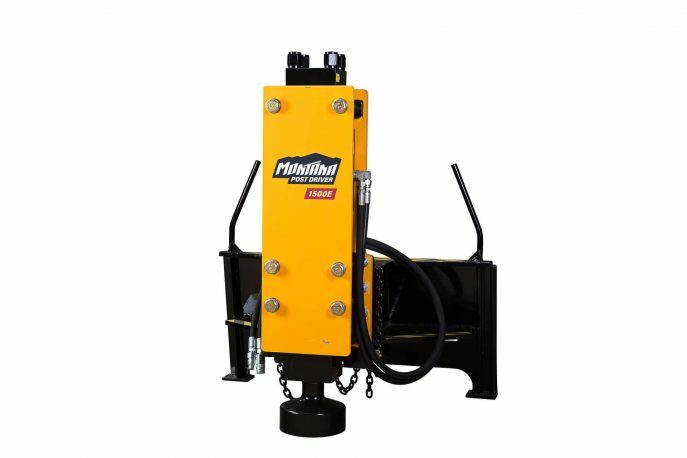 A Montana Post Driver accommodates wood, pipe, and T-posts, making it the most versatile equipment on the market. The frame and back plate are constructed from heavy steel plate for durability. 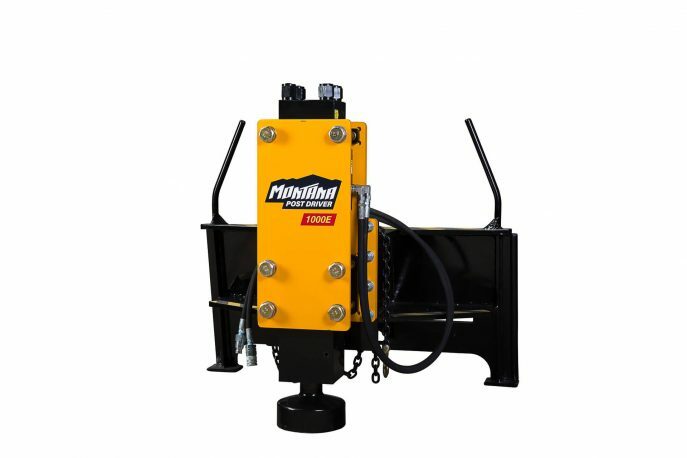 This rugged, easy-to-operate post driver universally attaches to most skid loaders or excavators. A truly low-maintenance product, our driver allows for fast and simple disconnection and reconnection. 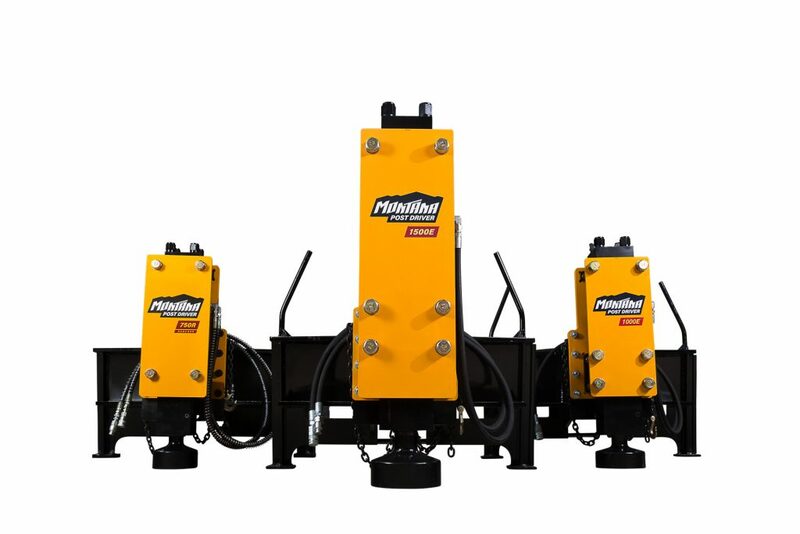 The hydraulic hammer we use has only two moving parts and a single grease fitting for easy lubrication.